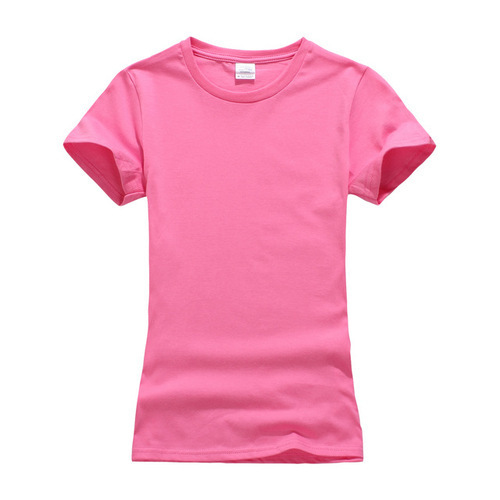 Owing to the presence of our expert team members, we have been able to offer a wide range of Plain Ladies T-Shirt. These exclusively designed and developed t-shirts are available in various styles, designs, range, sizes, as per the precise demands of clients. Our t-shirts are admired for their uniqueness and elegance. Besides, we also provide these in customized colors and range. Packaging Details As per buyer requirement. Clothing Manufacturers, Suppliers, Exporters in Tirupur in India. Started in 1992 , Vogue Sourcing is a government recognized Clothing Manufacturers, Suppliers, Exporters in India. Vogue Sourcing products are traditionally recognized for its excellence in quality, product range, service & reliability.Vogue Sourcing manufacturing all type of Clothing, Apparel , Garments, Home Furnishing products ranging from fashion styles to basic. Vogue Sourcing supply wide range of products Like T-Shirt, Polo's, Dresses, Pant, Skirt, Shorts, Pajamas, Nightwear, Hoodies, Sweatshirts, etc... for all the age group - Men's wear, Women Wear, Boys Wear, Girls Wear, Toddlers, Kids Wear & Infants. Vogue Sourcing have a vertical setup facilities and well experienced associates to design and produce our products in high quality international standard as per the customer requirement and expectations. SA 8000 Certified Garment Manufacturer & Exporter. Burea Veritas ISO 9001 Certified Garment Exporter. OekoTex Certified Garment Dyeing & Processing. Sedex Approved Supplier for our Garment Exports. Organic Clothing GOTS certified Garment manufacturer and Exporter. BSCI Certified Garment manufacturer and Exporter. All type of Clothing Products , Readymade Garments, Apparels both knits and woven for Men's, Women, Boys, Girls, Kids & Baby's. Home Furnishing products – Living Room, Kitchen, Bedding, Bathing, Hotel & Hospitality. Garment Trims – All type of Tapes, Ropes and Draw cord. Our Sister concern Design Textiles have commenced our business and established in the year 2000. Over the years, we are involved in manufacturing, exporting and supplying a broad spectrum of Knitted Tapes, Cotton Knitted Tapes, Polyester Stripes Knitted Tapes, Plain knitted Tapes, Polyester Thread, Nylon Rope, Elastic Tape, Herringbone Tape, Garment Seam Tape and Cotton Tape, Jacquard Tapes, Knitted Tapes, Multi Colour Tapes, Name Tapes, Polyester Tapes, Nylon Tapes, Twill Tapes, Canvas Tapes, Woven Tapes, Bright Tapes, Check Tapes, Print Tapes, Cotton Tubular Tapes, Synthetic Tapes, Gross Grain Tapes, Jacquard Tapes, Neon Tapes, Draw cord with Tipping, Name Draw cords, Cotton Draw cords, Polyester Draw cords, Nylon Draw cords, Jacquard Draw cords, Multi colour Draw cords, Twisted Ropes, Name Ropes, Rope without Name, Cotton Rope, Multicolour Rope, Tipping Rope, Polyester Rope, Tag Rope. We have successfully attained respectable status in the industry by making endless supply of quality approved range in the market. Our experts manufacture products using premium grade raw material, which is sourced from the authorized and well-known industrial vendors. We intend to cater to our respectable clients by understanding their desires as well as expectations, providing cost effective, reliable and quality assured products. Moreover, our products are applauded by customers for their excellent tear strength, high adhesion, temperature resistant and other superior attributes. Therefore, we are getting orders from them repetitively and have expanded our client base from all across the nation. Apart from this, our uncompromising commitment towards excellence and fair business dealings with clients has enabled us establishing respectable status in the industry.